JFK Lawn and Landscape can help you achieve the perfect lawn this spring! Spring is a beautiful time of the year. The weather is warm and ideal for a variety of landscaping tasks. 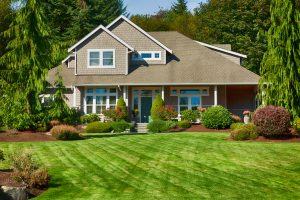 One of the best ways to enhance the curb appeal of your property is to turn your attention to your lawn during the spring and summer seasons. Every year, millions of homeowners try to achieve the perfect lawn but always come up a tad short. If you want to obtain lush green grass this season, there are a few things you should know! Do you know when the best time to water your lawn is? Many homeowners make the mistake of turning on their sprinklers either later day or in the evening. When you water at night, you are not giving your grass enough time to dry which can lead to disease. It is in your best interest to water early in the morning because the sun’s rays will help to dry out the excess moisture. It is also important to note that you are much better off watering your lawn less frequently, but for extended periods. Every time you water your lawn, you need to give it a good soak so that the ground can fully absorb the water. In order to achieve the perfect lawn, you want to ensure the grass is the same length everywhere. If there are areas in your yard that are sparser than others, you may need to reseed accordingly. Springtime is ideal for planting warm-seed grasses. Weeds are essentially blemishes to your yard. Dandelions, crabgrass, and other pesky weeds can quickly take over your lawn if you are not careful. There are all sorts of weed control products for prevention and treatment. Most of which can be picked up at your local nursery or hardware store. Although it may seem like mowing your lawn short will save you time, you are not doing yourself any favors. By cutting grass short, you are causing damage to the blades of grass. Many people do not realize that grass is at its healthiest when it tad longer. Also, for the best mowing results possible, you want to ensure that your mower blades are sharp before use. If your blades are dull, you want to sharpen or replace them as necessary. JFK Lawn & Landscape’s expert lawn mowing service guarantees weekly mowing intervals during the mowing season, approximately from April 1 through early November. This entry was posted on Tuesday, May 15th, 2018 at 4:19 pm. Both comments and pings are currently closed.